Inter and AC Milan meet at the San Siro on Sunday for the first Derby della Madonnina of the 2018/19 Serie A season. ​Inter have had the stronger start to the new season, winning their last six consecutive games in all competitions. AC Milan have also impressed in recent weeks, beating high flying Sassoulo 4-1 away from home. With the added spice of local bragging rights, a win would move M​ilan to within one point of their rivals. Here is everything you need to know about one of the fiercest derbies in world football. Inter have been impressive in recent weeks, having only lost two of their opening eight games this season. I Nerazzurri have won each of their last six games in all competitions, recording impressive wins over the likes of Spurs, Sampdoria, & Fiorentina. Milan come off the back of draws with Atalanta and Empoli and comfortable wins over Sassuolo, Olympiacos and Chievo Verona. For the hosts, Sime Vrslajko remains out injured, but he is the only concern for Luciano Spalletti to deal with. Otherwise, Inter are likely to remain unchanged from the side that defeated SPAL last week. AC Milan will be without two of their left backs this weekend, as Andrea Conti is still recovering from a knee injury he sustained back in April, while Ivan Strinic is also still on the sidelines due to a heart condition. Italian international midfielder Riccardo Montolivo is still suffering from an injury he suffered at the start of the season, while centre back Mattia Caldara is also likely to miss the fixture due to a muscular problem. Predicted Inter Lineup: Handanovic; D'Ambrosio, De Vrij, Skriniar, Asamoah; Vecino, Brozovic, Politano, Perisic, Nainggolan; Icardi. Predicted AC Milan Lineup: Donnarumma; Abate, Musacchio, Romagnoli, Laxalt; Kessie, Biglia, Bonaventura; Suso, Higuaín, Calhanoglu. Both Milan sides come into the fixture in good form, but as with the majority of derbies - form always goes out the window. 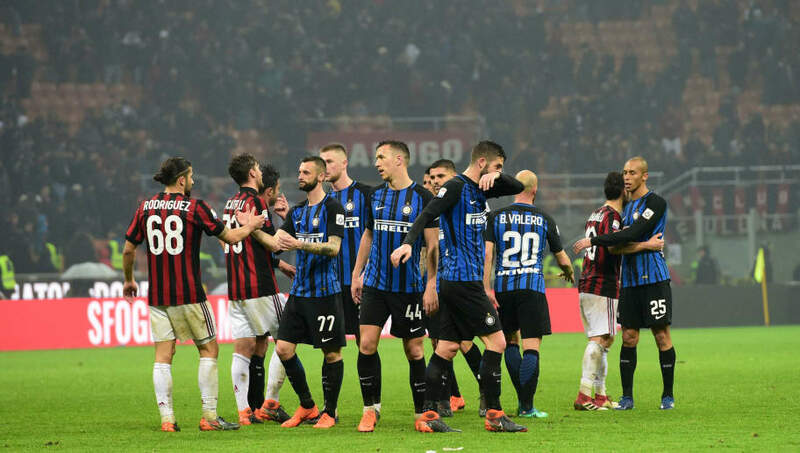 Looking at the history of the fixture, traditionally it produces high scoring games, but going off of last seasons 0-0 draw, Inter's 3-2 victory and Milan 1-0 win in the Coppa Italia it could mean that one goal could settle this contest.